Batting: Shane Dowrich 60* off 101 balls, Jason Holder 33* off 70 balls. Bowling: Lakmal 2/42 in 15 overs, Rajitha 2/36 in 10.3 overs, Kumara 1/40 in 16 overs. 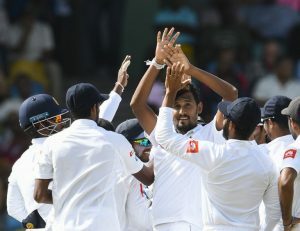 With the series on the line and the exclusion of their Test captain, Chandimal, Sri Lanka hoped to put on a good show on Day 1 of this test against West Indies. On the other hand, West Indies had the chance to start off on a positive note and create history by winning this test. The pitch looked lively and full of grass, basically a paradise for bowlers. However, after winning the toss West Indies captain Jason Holder chose to bat first. Devon Smith and Brathwaite opened the innings and Sri Lankan captain, Lakmal started the innings with the new ball. 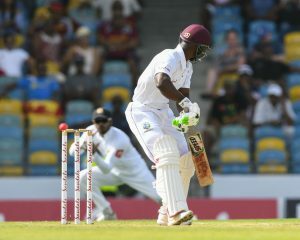 Smith’s batting woes continued as Lakmal got an early breakthrough in the 1st over and West Indies lost their 1st wicket. Powell joined Brathwaite. But, this partnership could only last 5 runs as Lakmal struck again to get rid of Brathwaite. And, in the very next over, Kumara got the wicket of Powell and suddenly West Indies scorecard read 8/3 in 6 overs. 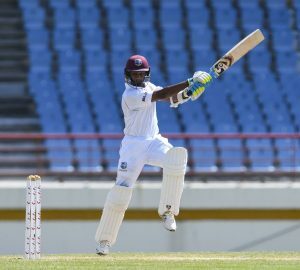 Shai Hope and Roston Chase were now present on the crease. This is when rain came and after less than an hour, play resumed. Lakmal and Kumara continued to bowl successive overs but couldn’t snuff another wicket. This is when the Sri Lankan captain, Lakmal brought on Rajitha. 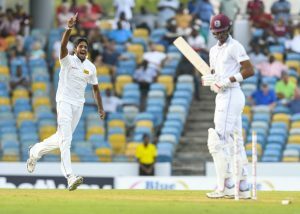 It was a smart move and it worked straightaway as Rajitha uprooted Roston Chase’s middle stump and West Indies lost their 4th wicket. Shane Dowrich joined Shai Hope. Both batsmen started playing their shots and held their composure till the end of the 1st session. 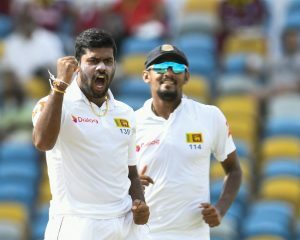 But, in the 2nd session, Rajitha struck again to dismiss Shai Hope and West Indies lost their 5th wicket. The West Indian captain, Jason Holder joined Shane Dowrich. Both batsmen shared a valuable partnership of 35 runs before rain halted play once again. Play resumed after rain stopped. Both batsmen continuing to defy Sri Lankan bowlers and soon raised their 50 run partnership along with Dowrich who reached his 7th test fifty. This is when rain stopped play once again and this time it didn’t stop and stumps were called as Day 1 ended with Sri Lanka on top. I find Devon Smith to be a bit arrogant but hey I dont care if he keeps playing the way he is. Be arrogant on the field but back it up. And he has done so very well. Join Allsportspk tomorrow for Day 2 of West Indies Vs Sri Lanka 3rd Test.